The 20-year-old Frenchman defeated Adrián Menéndez-Maceiras in the singles final. Frenchman Ugo Humbert has claimed his first title on the ATP Challenger Tour. The 20-year-old from Metz lifted the trophy at the 33rd edition of the Open de Castilla y León – Villa de El Espinar. Humbert defeated No. 2 seed Adrián Menéndez-Maceiras of Spain 6-3, 6-4 in Sunday’s singles final. The tournament’s No. 7 won 55 per cent of the total points played to prevail after one hour and 35 minutes. 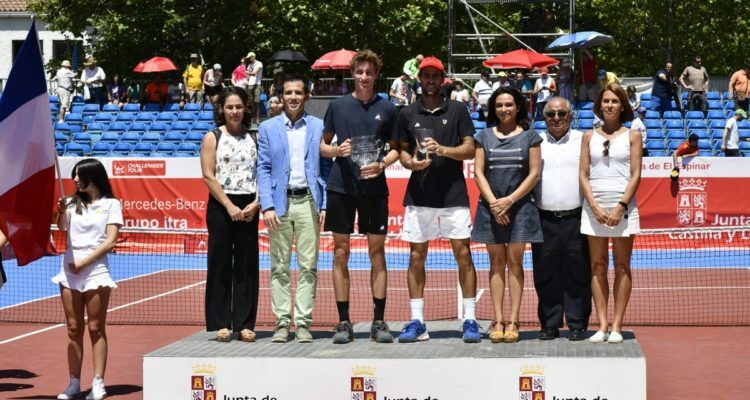 “I am really happy to have won my first ATP Challenger here in Segovia. It is a big victory for me,” Humbert commented afterwards. The World No. 184 added the title to his three ITF Pro Circuit trophies he had clinched earlier this season. Humbert collects 100 ATP-Ranking points and is projected to reach a new career high ranking at World No. 141 on Monday. He earns €12,250 in prize money. Andreas Artunedo Martinavarr and David Peréz Sanz clinched the doubles crown. The duo fought past Matias Franco Descotte of Argentina and Joao Monteiro from Portugal 6-7(3), 6-3, 10-6 to become the first all-Spanish combination to lift the trophy in Segovia since 2005. The final lasted one hour and 26 minutes. This entry was posted in ATP Challenger Segovia, ATP Challenger Tour and tagged ATP Challenger Tour, El Espinar, Open Castilla y Leon, Segovia, Ugo Humbert.